Whether you are a recent high school or college grad or simply want to change courses in your life, the most common way to start a career in a laboratory is through an entry-level job. These jobs in labs often entail many unglamorous tasks, such as filing paperwork, data entry and cleaning, but they offer an effective way of finding out how a lab actually works and if it is the right place for you in the long run. They are also an opportunity to learn more about what is being done in the lab, whether it's medicine, biology, chemistry or physics. Update your resume. Be sure to highlight any relevant scientific job experience, degrees or certifications. If you have no previous experience in the sciences, state in your objective why you want to work in a laboratory. Mention other desirable qualities you may possess such as computer skills, office organization and interpersonal abilities. Find useful job references. If you have an amicable relationship with a former or past science teacher, or a family friend who works in the science or health industry, ask them if you can use them for a job reference. If they accept, list them at the bottom of your resume with their full name, job position and contact info. Search online for laboratories in your area either through job search engines, job boards or company web pages. Some places that might be offering lots of entry-level positions include universities, hospitals and large corporations. If a company looks appealing to you, but doesn't list any job openings, send them a polite email asking if they are hiring with an attached resume. Answer promptly any emails or phone calls you see about setting up an interview or phone call detailing the job. Dress appropriately for the interviews. For an entry-level laboratory job, dress as you would if you were attending a nice dinner with your parents. That means clean pants, casual jackets, knee-length skirts, and no jeans or sneakers. Make sure your hair is clean and combed and there is no dirt under your fingernails. 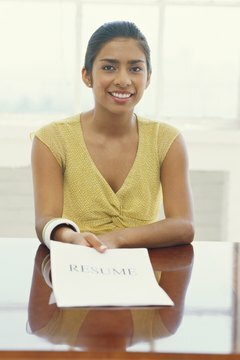 The more conservative or neutral-looking you can make yourself during the interview, the less likely the interviewers will discount you on the first impression. Show up early to your interview with all the information you need. This includes at least one copy of your resume and references in a folder, your Social Security card and your government-issued ID. If this is for a job at a school laboratory, you may also want to bring a copy of your transcripts so you can show off any outstanding grades you may have received in science classes. 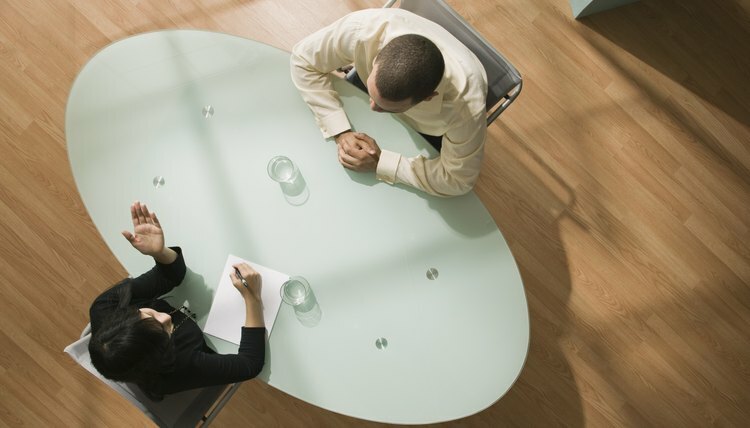 Be enthusiastic and professional during the interview. Make solid eye-contact and keep proper posture throughout. Answer all questions as precisely as you can with as few hesitations (like "um" or "uh") as possible. Don't ask about salary or vacation time. If they offer you the job, this is when they will tell you about the benefits. Follow up. After a couple of days, send a thank-you note to the interviewer. An email is fine, but it is even nicer to send a card through the mail. If you still haven't heard back in a week, it is OK to send an email saying you appreciated them giving you their time and that you would like them to keep you posted about further job developments. Don't stop looking for jobs while waiting to hear back from an interview. The perfect laboratory job for you may not be the one you just applied for, but the one you apply to next. Fay Reynolds was first published in 2004 for the "Columbia Missourian." She has worked as a critic for the "San Antonio Current," "Austin Chronicle" and "Complex" magazines, and as a senior editor at Vintage Foundation Publications. Reynolds holds a B.A. in English from the University of Missouri and is pursuing her M.A. in creative writing from the University of Texas at Austin. How Much Can Medical Laboratory Technicians Earn? How Much Do Licensed X-Ray Technicians Make an Hour? Reynolds, Fay. "How to Land an Entry-Level Laboratory Job." , https://careertrend.com/how-8725862-land-entrylevel-laboratory-job.html. 05 July 2017.